This cheeky Monkey handpainted needlepoint design is looking at you and asking to be stitched. He is handpainted onto 12 mesh Zweigart mono needlepoint canvas. The design area measures 10" x 10". 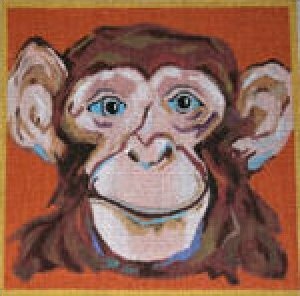 We can kit this Monkey handpainted needlepoint design for you. We use a DMC tapestry yarn and will match the shaded colors as closely as we can. Just select the "kit" option when you check out. This design ships for free, anywhere in the world, when you order the canvas with threads. This Monkey handpainted needlepoint design would make a beautiful pillow or picture for a child's room. 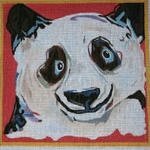 See the companion Panda and Flamingo handpainted needlepoint designs. Contact us with questions about this Monkey handpainted needlepoint design.